My view is that prolonged growth of inequality in developed economies is likely to be detrimental for human well-being (here are some references: 1, 2, 3, 4). People on the political right often defend this inequality by claiming that the super rich must be allowed to stay super rich because they are the motors behind job growth. 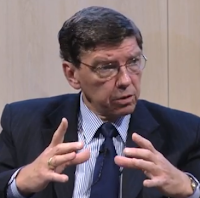 In this video, Clayton Christensen explains that how investments are made determines how economies develop. Essentially, investments can be targeted at three types of innovations: 1) empowering innovations which transform products from complex and unaffordable for the mass to simple and affordable, thereby expanding markets and creating jobs, 2) sustaining innovations, which make good products better, and which do not create many new products because they do not make markets larger, 3) efficiency innovations, which is making the same products at lower prices and which destroy jobs and free capital. As Christensen explains, under the influence of the development of the spreadsheet, a way of looking at finance has become dominant which is that the purpose of the organization is to maximize short term return on investment. Efficiency innovations and sustaining innovations can have fast impacts on improving short term return on investment but empowering innovations do not. This type of innovation tends to lead to return after several years, only. So, the way we have come to calculate success makes it impossible for innovators to invest in the kind of things that create jobs. So the rethoric of the right is not right. As Christensen says, most of the 1% don't use their capital to create new jobs but to create new capital. Empowering innovations are required to solve the job problem. So, while I think that raising taxes for the very rich is an essential part of the solution (read here why taxes are essential and can actually improve the economy's efficiency, contrary to what many believe), this may not be enough. More investment in empowering innovation is also required.